Several terms redirect here. For other uses, see Wunderkind (disambiguation), Whiz Kids (disambiguation) and Boy Genius (disambiguation). 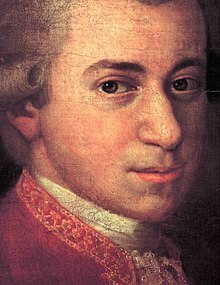 Mozart started composing at the age of five. The term wunderkind (from German: Wunderkind, literally "wonder child") is sometimes used as a synonym for child prodigy, particularly in media accounts. Wunderkind also is used to recognize those who achieve success and acclaim early in their adult careers. One subject never excelled as a child in mathematics, but he taught himself algorithms and tricks for calculatory speed, becoming capable of extremely complex mental math. His brain, compared to six other controls, was studied using the PET scan, revealing separate areas of his brain that he manipulated to solve the complex problems. Some of the areas that he and presumably prodigies use are brain sectors dealing in visual and spatial memory, as well as visual mental imagery. Other areas of the brain showed use by the subject, including a sector of the brain generally related to childlike "finger counting", probably used in his mind to relate numbers to the visual cortex. Noting that the cerebellum acts to streamline the speed and efficiency of all thought processes, Vandervert explained the abilities of prodigies in terms of the collaboration of working memory and the cognitive functions of the cerebellum. Citing extensive imaging evidence, Vandervert first proposed this approach in two publications which appeared in 2003. In addition to imaging evidence, Vandervert's approach is supported by the substantial award-winning studies of the cerebellum by Masao Ito. Rosemary Callard-Szulgit and other educators have written extensively about the problem of perfectionism in bright children, calling it their "number one social-emotional trait". Gifted children often associate even slight imperfection with failure, so that they become fearful of effort, even in their personal lives, and in extreme cases end up virtually immobilized. Gifted children often struggle with interpersonal relationships with peers. They may find it difficult to relate to others and may recognize that they are different than most children. Thus, these children might view themselves as needing to be separate. Gifted children often have trouble paying attention in class which can result with a mixed diagnosis of ADD or ADHD. Although it is possible for a gifted child to have these disorders, careful diagnostic measures must be taken. Gifted children often lack motivation to complete certain tasks if they feel that they are not being challenged enough. When gifted children are not provided with engaging material, their lack of focus may be perceived as an attention deficit disorder. Children who equate their performance with their self-worth often become perfectionists and struggle to perform to their own ideal standard, often setting bars for themselves that are too high and becoming angry, upset, or even depressed when they fail to meet their own expectations. Specialists theorize that the spoken word can be difficult for some gifted children because they have the added task of translating the complex ideas in their heads into language that others of similar age can understand. This process can lead to abnormal hesitation when speaking, stuttering, and frustration on the part of the child. ^ Feldman, David H.; Morelock, M. J. (2011). "Prodigies". In Runco, Mark A.; Pritzker, Steven R. Encyclopedia of Creativity. Encyclopedia of Creativity (Second Edition). Academic Press. pp. 261–265. doi:10.1016/B978-0-12-375038-9.00182-5. ISBN 978-0-12-375038-9. Lay summary (8 April 2015). For the purposes of this and future research, a prodigy was defined as a child younger than 10 years of age who has reached the level of a highly trained professional in a demanding area of endeavor. ^ Rose, Lacey (2 March 2007). "Whiz Kids". Forbes. Retrieved 3 April 2015. At the moment, the most widely accepted definition is a child, typically under the age of 10, who has mastered a challenging skill at the level of an adult professional. ^ Feldman, David Henry (Fall 1993). "Child prodigies: A distinctive form of giftedness". Gifted Child Quarterly. 27 (4): 188–193. doi:10.1177/001698629303700408. ^ a b c Butterworth, Brian (January 2001). "What makes a prodigy?". Nature Neuroscience. 4 (1): 11–12. doi:10.1038/82841. ^ Kivy, Peter. Sounding Off: Eleven Essays in the Philosophy of Music. Oxford. p. 24. ^ Historical Dictionary of British Theatre: Early Period. Scarecrow Press. 2013-10-10. p. 186. ISBN 9780810880283. ^ Taylor, Jim. “The Problem of Giftedness.” Psychology Today, Sussex Publishers, 19 Nov. 2009, www.psychologytoday.com/blog/the-power-prime/200911/the-problem-giftedness. ^ Rosemary Callard-Szulgit, Perfectionism and Gifted Children. 2nd edition, R&L Education. July 31, 2012. ^ “Accommodations and Modifications.” National Association of Special Education Teachers, 2001, www.naset.org/giftedandtalented2.0.html. ^ Jr, Chester E. Finn (2012-12-22). "Gifted Students Have 'Special Needs,' Too". The Atlantic. Retrieved 2019-02-28. ^ "Special Needs of Gifted Children | SpecialNeeds.com". www.specialneeds.com. Retrieved 2019-02-28. Notebook: Child Prodigies on YouTube, "CBS News Online", February 26, 2010.